The immersive exhibit rings in a new era at the renovated museum. A flock of thousands of paper kites has taken flight within the Crow Museum of Asian Art, presiding over one of the newly-renovated galleries like an impending storm. 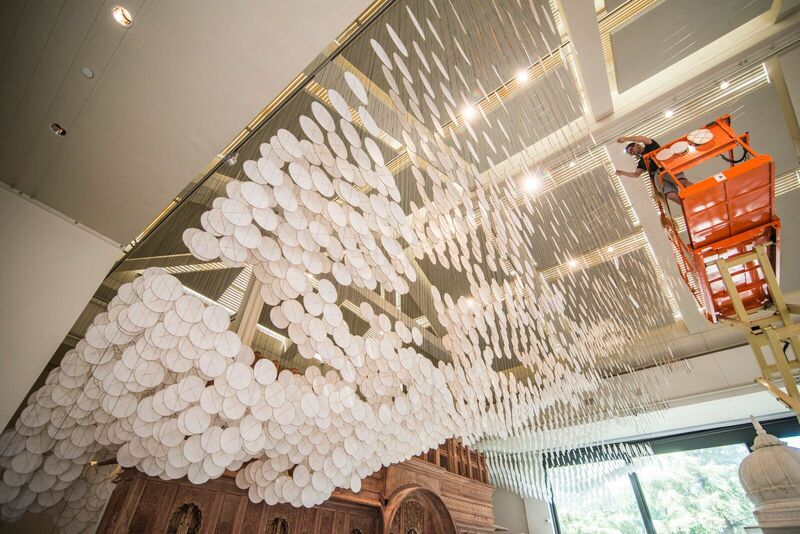 The installation, named Nuvole, is the centerpiece of Jacob Hashimoto: Clouds and Chaos, one of five new exhibitions at the 20-year-old Dallas museum. The shows have ushered in a new era at the Crow Museum, which just unveiled a multi-million dollar expansion, a new name (goodbye, Crow Collection), a revamped gift shop, and an interactive art studio on Pearl Street. Clouds and Chaos is headlining the museum’s renaissance. In addition to Nuvole, the exhibition includes Hashimoto’s newest woodblock and intaglio works, on view for the first time in a U.S. museum. You’ll have a hard time keeping your head out of the clouds, though. Nuvole winds through the Grand Gallery, grazing major works from the museum’s collection and creating an ethereal dreamworld. 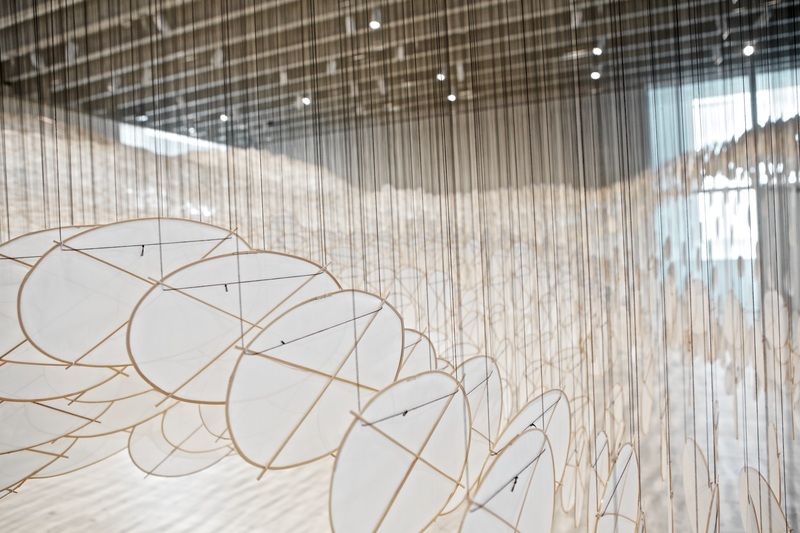 The immersive, site-specific installation uses the form of a traditional handmade kite to create a dynamic, moving veil of wispy clouds and shadows. Each “kite” is a disc fashioned from cut paper collage and bamboo, then strung from the ceiling. (Hashimoto drew upon sculpture students at UNT Denton to help with the week-long installation process.) On their own, the objects fall somewhere between sculpture and painting. They’re rigid, minimal, geometric. Group them together, and they take on a new life. Hard edges begin to blur and the piece becomes a force of nature. Crow Museum Curator Jacqueline Chao recalls her first time seeing one of Jacob Hashimoto’s surreal installations in 2012, when she was living in Chicago. Jacob Hashimoto: Clouds and Chaos is on view at the revamped Crow Museum of Asian Art through April 7, 2019. The other new exhibitions, which include Our Asian Art Museum: The Crow at Twenty and Immortal Landscapes: Jade from the Collection, are also worth checking out. Admission to the museum is always free.